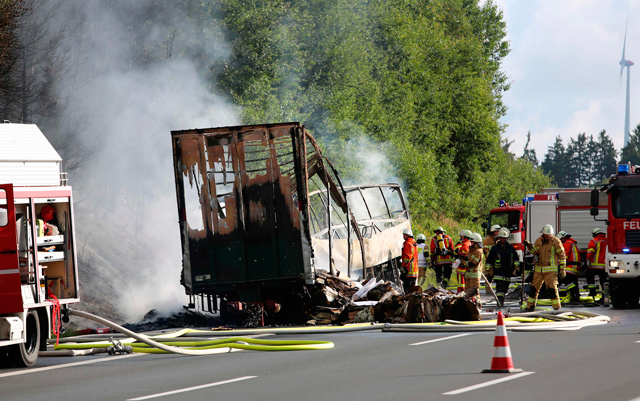 Up to 18 people were feared dead after a tour bus carrying pensioners burst into flames following a collision with a trailer truck in southern Germany on Monday, police said. There was "only a glimmer of hope" that some of them would be found alive outside the coach, police spokesman Juergen Stadter told news channel NTV, which showed images of the vehicle's charred skeleton. "Maybe someone ran away in shock," he said, adding that 18 people were still missing, raising the figure earlier given by police. Another police spokeswoman, Anne Hoefer, told AFP that the passengers were "old people" and that some may not have made it out of the bus. Some of the 30 passengers pulled out of the burning bus were seriously hurt, added Stadter. The bus carrying 46 passengers and two drivers rammed into the trailer in a traffic jam on the motorway A9 close to the Bavarian town of Stammbach. The crash shortly after 7 am (0500 GMT) sent the bus up in flames. According to the Bild newspaper, the coach was travelling from the eastern region of Lausitz and heading for Nuremberg. The region close to the Czech border is also dotted with spas and castles, and the A9 is a trunk motorway leading to many popular summer holiday spots. An emergency team, including firefighters and rescue workers, were at the scene, while traffic on the motorway was halted in both directions. Those hurt were being flown by rescue helicopters to hospitals, many with life-threatening injuries. If those missing are confirmed killed, the accident at the start of the summer holiday season would be one of the worst to hit Germany. 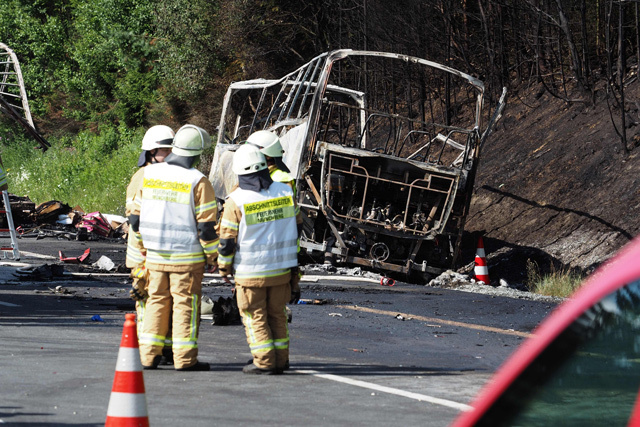 Among the deadliest in recent years was a collision in June 2007, when 13 people were killed as their tour bus drove off the road and plunged several metres down a slope in eastern Germany's Saxony-Anhalt state. Across Europe, the last such fatal accident struck on January 21 in Italy, when an accident involving a Hungarian bus carrying teenagers left 16 dead.